Linda Rottenberg and Chris Bierly argue in this opinion piece that the best incubator for entrepreneurship occurs when entrepreneurs form close networks and nurture fellow risk-takers with their experience and resources. Rottenberg was named one of “America’s Best Leaders” by U.S. News & World Report and one of TIME’s 100 “Innovators for the 21st century,” and is author of The New York Times bestseller, Crazy Is a Compliment: The Power of Zigging When Everyone Else Zags. Chris Bierly is a vice president and director in Bain’s Boston office, and a leader in its principle investments, media, education, and consumer and retail areas. Rottenberg is co-founder of Endeavor, which supports high-impact entrepreneurs. Bierly is a senior advisor at Endeavor. Few ideas in business conjure more vivid images of bold individualism than the do-it-yourself entrepreneur. Entrepreneurs go it alone, the mythology insists. They are swashbuckling mavericks, bucking the establishment. The image is irresistibly romantic and deeply entrenched. It is also completely misleading. We have groundbreaking evidence that the most vibrant entrepreneurship is developed by high-impact entrepreneurs when they operate in tight-knit networks, nurturing fellow risk-takers and trading know-how, capital and tough love. We’ve mapped this cross-pollination across generations and continents. And we’ve done this not by looking at the most obvious communities, like Silicon Valley, but at some of the harshest terrain for innovation. For years, academics and civic planners have agreed that entrepreneurship drives economic development, innovation and job creation. Yet all too frequently, government-led initiatives produce lackluster results. We’ve seen this in Kuala Lumpur, where the $150 million BioValley project has yielded just a handful of biotech companies. In Moscow, officials have spent over $2 billion without a major start-up success. Even Santiago, well known for its Startup Chile program, has put $40 million into more than 800 start-ups, only to have almost 80% of them leave for greener pastures in places like Silicon Valley and New York City. The problem in each case: No local network in which start-ups scale, scale-ups succeed and successful entrepreneurs infect the next generation with the entrepreneurship bug. 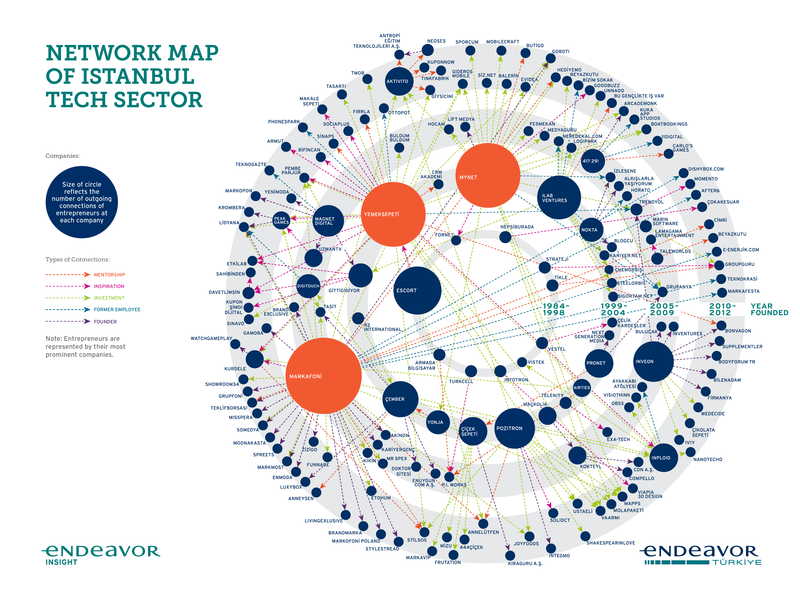 Since 1997, Endeavor, a non-profit organization in the field of high-impact entrepreneurship, has successfully worked to spawn “entrepreneurial ecosystems” around the world. With offices in 25 countries, Endeavor identifies, mentors and co-invests in entrepreneurs with the biggest ideas, the likeliest potential to build companies that matter and the greatest ability to inspire others. Endeavor focuses on this “high-impact” group because we believe that if you give them the right mix of support, encouragement and tough love, they can act as multipliers, becoming the role models, mentors and investors who build a local ecosystem of entrepreneurs from the ground up. 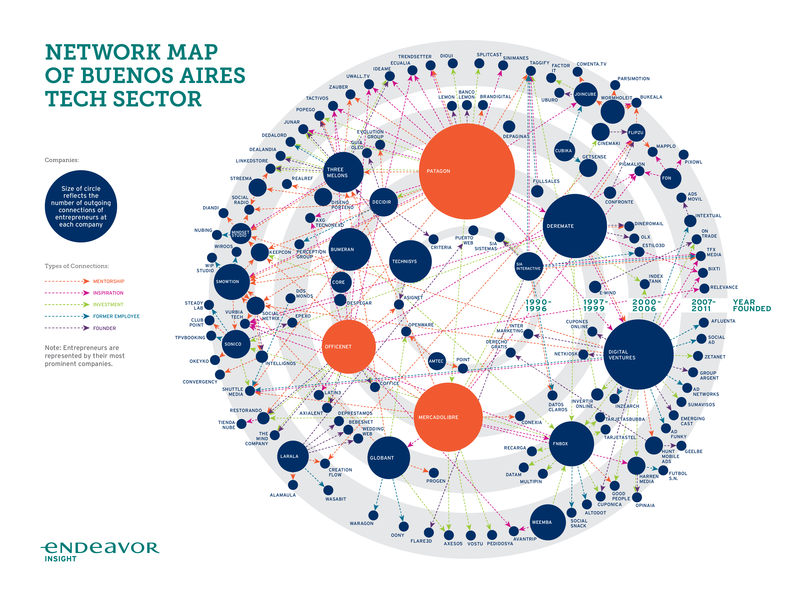 Endeavor’s more than 1,000 entrepreneurs have created over 500,000 jobs globally, generating $8 billion in annual revenues and giving back to the cities where they got their start. They have succeeded in building vibrant ecosystems in some of the most inhospitable business environments in the world. To better understand how this dynamic works, Endeavor partnered with Bain & Company to study the multiplier effect in three difficult markets — Buenos Aires, Istanbul and Mexico City. The research supported what we have long seen on the ground: Entrepreneur networks don’t start with gleaming facilities or government guarantees, nor do they spring spontaneously from successful companies. Instead, a few pioneering founders get the support they need at a critical early phase of their development and then actively spread the entrepreneurship fever by mentoring, inspiring and investing in subsequent generations of entrepreneurs. These founders aren’t Darwinian, surviving at the expense of others. They see cross-company collaboration as being good for their businesses and good for the ecosystem. Consider what’s happened in Buenos Aires amid a history of economic and political strife. In the early 1990s, when Wences Casares moved there, the city was a wasteland for start-ups. Casares, the son of a Patagonian sheep farmer, had dabbled in business as a teenager, starting a T-shirt company and printing a telephone directory. In college, he had the idea to start an online brokerage called Patagon.com. Thirty-three local investors turned him down. “We don’t even have a functioning stock market,” he was told. He quit school and launched the company anyway. We have come to think of Casares as “patient zero” in the spread of entrepreneurship in Argentina. While getting his business started in 1997, he met others burning with this strange passion. These included Andy Freire and Santiago Bilinkis, alums from Procter & Gamble who founded an online office-supply company called Officenet. Not long after, a pair of Stanford MBAs, Marcos Galperin and Hernán Kazah, returned to the country to form MercadoLibre, an eBay-style online retailer. From this isolation, a fever of entrepreneurship overtook Buenos Aires, fed in large measure by the success of these three companies. In the span of a few years, Casares sold Patagon to Banco Santander for $750 million; Officenet sold to Staples; and MercadoLibre went public on the NASDAQ, reaching a market capitalization of $5.5 billion in 2014. Today, Buenos Aires is in the midst of an entrepreneurship epidemic. Two decades after MercadoLibre, Patagon, and Officenet got their start, the city is the leading hub for tech entrepreneurship in Spanish-speaking Latin America. These three firms alone have influenced more than 200 second-, third-, and fourth-generation businesses. Their founders have launched new companies, VC funds, and even a popular TV show about entrepreneurship (“El Emprendedor del Millón”). Whereas Argentine entrepreneurs once felt isolated and mistrusted, now anyone with a dream can tap into a thriving ecosystem of support. There are conferences, meetups, bars where founders congregate, dance clubs where they mingle, even a soccer league where each team is named after a start-up. Entrepreneurship has become a national obsession. We then followed up with dozens of in-depth interviews to identify specific ways in which entrepreneurs benefited from, or offered assistance to, others. We found that nearly 80% of today’s tech companies in Buenos Aires trace their roots to Patagon, Officenet and MercadoLibre. We consider these first-generation entrepreneurs the super-carriers of the entrepreneurship virus. While their companies were individually successful, the firms had their biggest impact on the network by mentoring new entrepreneurs, investing capital in their companies, supplying experienced talent, and starting new ventures themselves. Our results show that from 1990 through 2006, the number of technology start-ups in the Argentine capital grew by 5% a year. But over the next five years, that rate accelerated to 20% annually. The best way to visualize this phenomenon is on a social network map (see Figure 1). The bubbles represent companies and the multicolored arrows represent different types of connections. We placed companies on a series of concentric circles, like rings on a tree, based on their founding year. The size of each bubble corresponds to the number of connections it has made. The bigger a company’s bubble, the more influence that company and its founders have had on the rest of the network. The role that these super-carriers play in creating and accelerating the growth of an entrepreneurial ecosystem is not unique to Buenos Aires. We repeated our analysis in Istanbul (see Figure 2) and Mexico City, and the results were essentially the same — a few very successful entrepreneurs spawn others and the effect multiplies over time. We then conducted 700 interviews in New York City to see if the phenomenon carries over to more mature economies. Starting with early pioneers like DoubleClick, connections there skyrocketed between 2003 and 2013 (see Figure 3), fueling a corresponding explosion in start-up activity. Today, over 2,000 tech companies in New York have attracted $14 billion in investment and employ 53,000 people. Entrepreneurship doesn’t just spread on its own. It spreads because more experienced entrepreneurs actively cultivate the growth of those around them. For any young entrepreneur, a huge gap exists between drawing up an idea on a napkin and bringing it into the world. First-generation entrepreneurs help aspiring founders recognize the cracks in their businesses and how to address them with a revamped revenue model, a customer acquisition plan or an effective human resources strategy. Casares sets aside an hour a day to help others, usually in the late afternoon when he’s transitioning from work to home. The founders of Officenet, Freire and Bilinkis, set the goal of helping three new companies a year by making introductions, reviewing business plans and helping with fundraising. Bilinkis advised the two to ditch their plan, finish their degrees, and go work for a company for a year or two. He met the pair 10 more times before they showed up unannounced one day and pitched him an idea to start an online restaurant reservation system called Restorando. Bilinkis liked the concept but not their approach. “They were young, hungry and smart,” he said. “But they were engineers, so they didn’t know how to start a company.” He and Freire nonetheless gave them $500,000 in seed capital to tweak their model and build a prototype. They also introduced the pair to Nicolas Szekasy, an early MercadoLibre executive who, with Mercado Libre co-founder Kazah, had co-founded a $135 million venture capital firm called Kaszek Ventures. Szekasy in turn introduced the Restorando founders to Niklas Zennstrom, the co-founder of Skype and leader of the global VC fund Atomico, who helped them complete a Series A round of more than $3 million – a rare sum in Latin America. One of the biggest misconceptions about how entrepreneurship spreads is that it’s all about that first leg up. That’s critical, of course, but young entrepreneurs also need help managing the treacherous process of scaling a fast-growing enterprise. Our research clearly indicates that one reason entrepreneurship has blossomed in these communities is that older entrepreneurs didn’t just sprinkle some goodwill and angel investing and then disappear. They stuck around to help their younger colleagues navigate tricky growth decisions. Juan Carlos Vera and Andres Rodriguez were childhood friends from Colombia who started a technology business that was soon wiped out by the country’s financial crisis. Years later, after Vera built a mobile solutions firm and Rodriguez helped build Apple’s Siri, the two reunited in Mexico City and developed a proprietary technology that helped companies use artificial intelligence to communicate more efficiently with customers. Their company, BlueMessaging, got off to a promising start, growing at more than 100% annually in its first three years. But when growth slowed, Vera and Rodriguez knew they needed help. They turned to a community of entrepreneurs around Mexico City who were eager to lend a hand. One issue: All the employees at BlueMessaging were young and green. Alonso Carral, an established entrepreneur who started Mexico’s first Internet service provider (ISP) and sold it to CompuServe, told the founders they needed more grown-ups around the office. “He explained to us we did not have a finance or marketing problem, we had a people problem,” Rodriguez said. Carral helped the BlueMessaging duo find a headhunter, and the two hired a CFO, COO and others, including an experienced hand from Boston Consulting Group. Sometimes, the most critical advice is as much about eliminating options as creating them. When Firat and Fatih Isbecer founded Pozitron, an Istanbul-based mobile money business, for instance, they met Wences Casares through Endeavor. At the time, Pozitron had some traction in mobile solutions but was tempted by other adjacent businesses. “Wences encouraged us to move away from other services we were offering such as [customer relationship management] and focus solely on mobile solutions,” Firat said. The advice paid off. The Isbecers sold Pozitron in 2014 in an exit worth $100 million. Helping founders decide when to exit and how to do so gracefully is invaluable. In the mid-2000s, Globant, one of the fastest-growing IT companies in Buenos Aires, faced a tricky decision: Sell the company to one of several willing buyers or risk holding on amid Argentina’s mercurial economic environment. Globant’s CEO, Martín Migoya, and his co-founders had been inspired early on by MercadoLibre and turned once again to the Buenos Aires network for advice. The message was clear: “Your outlook is strong and you have real prospects for growth. Turn down the money.” Migoya and his partners wavered, but felt buoyed by the support. “We could have been millionaires at the age of 30,” he said. “It was very tempting. But we decided that we should not sell.” Instead they continued to expand and Globant, which went public on the NYSE in 2014, is now valued at $1.1 billion. One of the more striking things we found in studying these ecosystems is how willingly entrepreneurs gave back to the network and their communities once they achieved their own success. When young entrepreneurs get support from first-generation founders, the unspoken message is that it’s their duty to pay it forward to others. In countries without long histories of business collaboration, this shift in mentality is critical. It helps to create a virtuous cycle in which the mentored become mentors and the students become teachers. A growing network of tech entrepreneurs in Istanbul shows how this cycle works. Equal parts friendship, business and mentorship bond this group. Members play poker together, go clubbing together and vacation together. At 39 and 47, Nevzat Aydin and Sina Afra are the senior members of the group. They met in the 2000s when Aydin was starting Yemeksepeti, an online food ordering company, and Afra was starting Markafoni, a flash-sale website similar to Gilt Groupe. In 2011, Naspers, the South African media giant, acquired Markafoni at a valuation of $200 million, making Afra an instant rock star in the tech community. Four years later, Aydin sold Yemeksepeti to Delivery Hero for $589 million, making it the largest tech exit in Turkey’s history. Having “gone big,” Aydin and Afra turned back to Istanbul, the city that helped them get their start. As trusted advisers, they helped the Isbecer brothers expand and sell Pozitron. They also became mentors to a new generation of entrepreneurs like Hakan Bas, the founder of Lidyana, Turkey’s leading online jewelry and accessories business. But for anyone looking to create this kind of dynamic climate for business and innovation, it is crucial to understand that it doesn’t just happen because somebody builds an incubator or creates a seed-financing fund. It requires seeking out the high-impact entrepreneurs in a given market and helping them scale through the right mix of mentorship, investment, connections and resources. Once a handful of local scale-ups have succeeded, the multiplier effect can take hold and the ecosystem can begin to sustain its own growth. That creates a deep reservoir of support and resources that companies can draw on throughout their life-cycle, from start-up to maturity. We’ve seen time and again, even in the most challenging business environments, that high-impact entrepreneurs exist in every market. The key is finding them, helping them scale and encouraging them to let the contagion spread. Hi Linda and Chris, I read in the beginning of this article the high failure rate of entrepreneurs in many of these groups. I believe that is because almost the entire entrepreneurship community is betting on digital technology and healthcare. These by nature are extremely high risk. there are only going to be so many Microsoft’s / Amazons / Facebooks / and Googles. The US economy was built on manufacturing. When you seek for help in the entrepreneur community for manufacturing and retail it is almost impossible to get anyone in community to listen… yet most true jobs come from industry / manufacturing. There needs to be a paradigm shift if we really want to improve the world through entrepreneurship and employ millions of people who are never going to be computer engineers. It is amazing to me how people assume entrepreneurship can only come from a limited number of nations. The entrepreneur is commonly seen as an innovator — a designer of new ideas and business processes. [ Management skills and strong team building abilities are often perceived as essential leadership attributes for successful entrepreneurs. [ Political economist Robert Reich considers leadership, management ability, and team-building to be essential qualities of an entrepreneur. Entrepreneurship is often associated with true uncertainty, particularly when it involves the creation of a novel good or service, for a market that did not previously exist, rather than when a venture creates an incremental improvement to an existing product or service. A 2014 study at ETH Zürich found that compared with typical managers, entrepreneurs showed higher decision-making efficiency, and a stronger activation in regions of frontopolar cortex (FPC) previously associated with explorative choice. •	Bill Gates, founder of Microsoft. There are probably not many people that have not been touched by one of his products, such as Microsoft Windows, Microsoft Office and Internet Explorer. •	Steve Jobs, co-founder of Apple computers, which produces Macs, iPods and iPhones, as well as Apple TV. •	Mark Zuckerberg, the founder of Facebook. •	Pierre Omidyar, founder of eBay. •	Arianna Huffington, founder of the Huffington Post, a well-known online news site. Because a few, typically young firms grow rapidly and account for much of job creation, finding an effective way to support their growth is important. Predicting which firms will fail and which will succeed is virtually impossible, so policymakers are better off striving for the more modest goal of helping high-growth-potential firms. Policies that make it easier to engage in trial-and-error experimentation are typically more effective than trying to pick winners. An enabling environment for entrepreneurs, banks, and investors can support high-growth-potential firms and weed out failures. Some support will inevitably go to failing start-ups and lead to considerable job destruction. A focus on complementary institutions to support high-growth-potential firms requires changes across multiple fronts (from bankruptcy to employment protection legislation), which can be challenging to implement. Collecting comprehensive data on entrepreneurship is difficult. Predicting which firms will fail and which will succeed is virtually impossible. New firms account for a disproportionate share of aggregate job creation in advanced economies. Yet most firms fail, and it is immensely difficult to predict which firms will succeed. Policymakers can set the right conditions so that capital and other resources flow to firms with high growth , even if this implies initially supporting firms that ultimately fail. Policy can focus on supporting complementary institutions that promote trial-and-error experimentation both by increasing the chances that promising firms get further funding and by facilitating the efficient shutting down of firms when they do not meet their potential.